Everything that happens on Guatemala’s Rio Dulce happens because of the water. 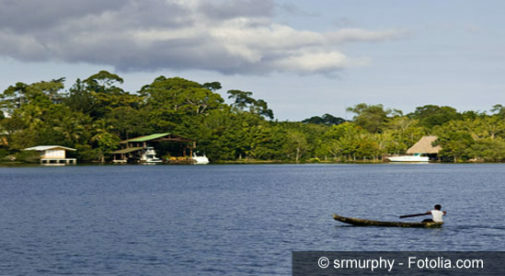 Rio Dulce translates as “Sweet River”…and life here is truly sweet. Mammoth lily pads blanket the lagoon. Wooden paddles from canoes slap the surface of the water. Birds are everywhere. There are more shades of green than you can count. Life moves in slow motion. Casey Brooks has found a new home in this watery haven. Before moving to Guatemala, Casey—a native of Montana—was in Florida for a few years, working construction on new homes and renovating others. When the real estate market began to crumble, he decided it was time to set sail. “I left the States to cruise Central America and bought a piece of property in the Rio Dulce where I decided to stay,” says Casey. For the past six years he has lived along the waterfront. The tiny community of Cayo Quemado is the closest town. It is home to about 80 Guatemalan families and an ever-growing number of expats. The increasingly popular tourist destination of Livingston is located about six miles downriver from Casey’s property. Although many people come to the Rio Dulce area to retire, Casey is still working. “Opportunity is everywhere,” he says. “Guatemala is open for business. Government leases with easy terms and no restrictions are readily available for securing property. I pay an annual lease payment—similar to real estate taxes in the U.S.—of $550 for 328 feet of waterfront property,” he explains. Casey has taken advantage of the abundant opportunities to continue his construction business: Rio Dulce Waterfront. Casey builds wooden homes with metal or thatched roofs that are in harmony with the natural environs of the region. “I can build a 1,500-square-foot, custom home with a dock for around $60,000,” he says.